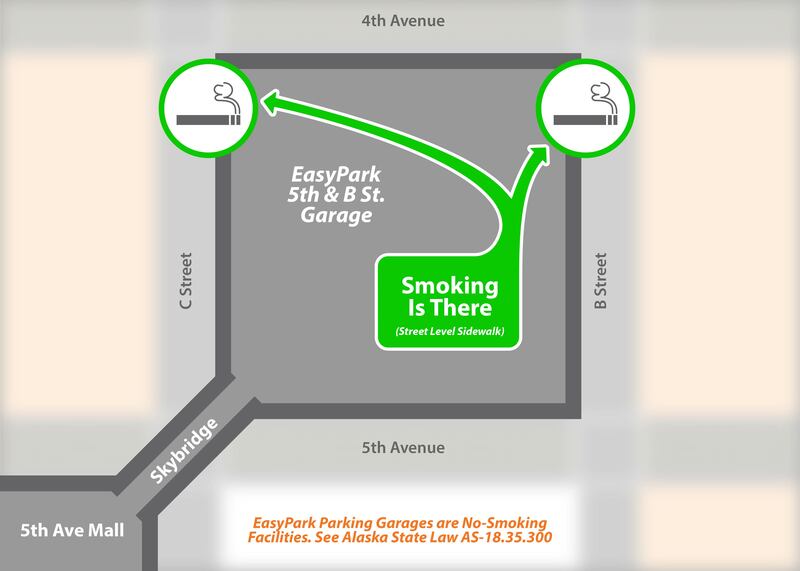 EasyPark has taken the step to become smoke-free in the four parking garages that EasyPark manages in downtown Anchorage. Designated smoking areas have been created to accommodate smokers who park at these locations and additional no-smoking signage has been installed throughout the facilities. “Air-quality and ventilation in parking garages is a high priority. By going smoke-free in our facilities we help ensure that our customers, visitors, and employees can walk through a healthier environment free of second-hand smoke while utilizing our parking facilities,” said Brian Borguno, Parking Director for Anchorage Community Development Authority. EasyPark supports the smoke-free initiatives that the State of Alaska and the Municipality of Anchorage have taken thru the years and most recently the state-wide smoke-free initiative in all businesses. The smoke-free policy encourages health and promotes a supportive environment for our customers and employees in all EasyPark parking garages and for those who want to quit using tobacco. For more information about EasyPark and parking locations, visit www.easyparkalaska.com or follow EasyPark’s Facebook page at EasyPark Alaska.